How We Live In Cities is a feature event for the BIG on Bloor Festival of Arts and Culture, taking place from 1:00 PM- 7:00 PM on Saturday, July 22, and from 12:00 PM-6:00 PM on Sunday, July 23, 2017, at car-free Bloor Street between Lansdowne Ave and Dufferin Street, with up to 100,000 people attending. How We Live In Cities Hub is located just West of Dufferin Ave. on the South side of Bloor Street, in front of the Tennis Courts. Gardens lower the city’s carbon footprint. They mediate summer heat, water run-off, promote food security, provide animal and insect habitat, improve air quality, enhance urban appearances and gardening provides healthy, self-directed exercise fostering better health and mindset. At the Garden Centre people can check the workshop schedule, mark their place on the green asset map, contribute information, ideas, make a garden button and offer a Garden Wisdom quote. Festival-goers can learn about on-going Spot Gardens as an effort to encourage garden-making. Spot Gardens are a start-up with intentions to foster an art and garden corridor to link civic, commercial, institutional and residential spaces along a greened Walk Here corridor. 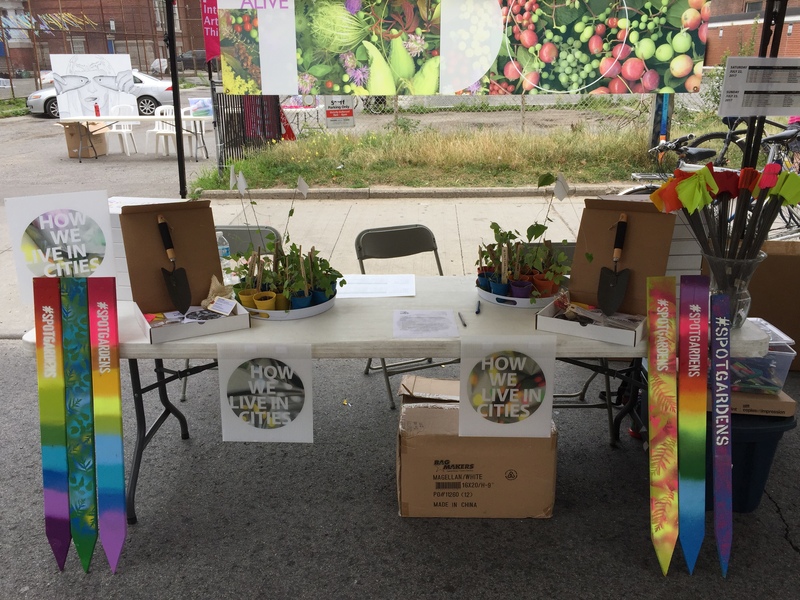 Festival goers can sign-up to make a Spot Garden and create a Spot Garden way-finder, marker flag, and win a Spot Garden Tool Kit while supplies last. Eric Charron’s workshop centred around installations of hanging lights and wind catchers, constructed from recycled materials. His regenerative Sun Lights demonstrate the use of recycled plastic water bottles made luminescent by solar LED technology. This workshop featured creation demonstrations, and opportunities for all ages to help make sculptures for gardens. Eric Anthony Charron is a Toronto-based architect, urbanist and reclaimed materials artist. He founded upcycledXD in 2009 with a series of design experiments in direct response to a garbage strike. His creations are situated between utility, reusability, abundance and delight. Recent installations include: Sun Lights and Place and Placement, Re-Imagine Galleria for How We Live In Cities; Blue Light, PULP ’17; Bottom’s-Up Chandelier, The Centre for Social Innovation for Spadina Office; Bottom’s-Up Chandelier, Spazio Del-Arte Gallery; UpcycledXD, The Azure Awards Gala. David’s workshop focused attention on wildlife, urban habitat and the animals we share space with. Working in malleable materials, he responded to audience requests to spontaneously create animals and insect sculptures. The workshop invited hands-on, shared participation in sculpture-making, accompanied by discussions regarding how gardens support urban wildlife habitats. David Acheson’s sculptural and photographic works riff on popular imagery, graphics and signage, to occupy places in the nature – culture gap. His figures move in and out of the particular and the unknown while inviting acts of recognition, and standing as small monuments to collective solitude. In this workshop, led by filmmaker Annette Mangaard, visitors animated the lifecycle of a garden by building a zoetrope, a pre-film animation device that produces the illusion of motion through a sequence of drawings or photographs. Annette Mangaard has written, and directed sixteen films in more than a decade as an independent filmmaker. She was nominated for a Gemini for Best Director of a Documentary for her one-hour documentary about the celebrated Canadian artists collective, GENERAL IDEA: ART, AIDS, AND THE FIN DE SIECLE (for TVO, Bravo, SCN, and Knowledge). The film premiered at Hot Doc’s in Toronto before going on to garner accolades at the Vancouver International Festival, DOCSDF Mexican Documentary Film Festival and Asolo International Art Film Festival in Italy. Inspired by New Zealand, where the Whanganui River was recently granted the same rights as a person, Kathleen collected and shared water stories for Walk in the Water / Marcher sur les eaux, an interactive art installation that invited visitors to re-imagine our precious Ontario/Quebec waterways and the futures we hope for them. For the BIG On Bloor Festival 2017, Kathleen’s Gardens of Water also reminded visitors that the survival of all things depends on our water system, and she offered ideas on the ways people can improve the health of our waters through slight changes in daily practices that reduce water consumption, such as avoiding plastics and chemical fertilization, and not flushing medicine or fish into our sewage systems. The installation included a large map of the water’s route through Garrison Creek, under Dufferin Grove Park to Lake Ontario, and into the St. Lawrence River towards the Gulf and the Atlantic Ocean. Participants observed water samples and photos from along the 1400 kilometre route, and contributed their own water stories to the collective audio archive. Kathleen Vaughan is an artist and educator whose work takes an environmental focus. She has a walking practice that contributes to her art making, and is known for her textile maps of walks in urban woods and green spaces. Once a long-time Toronto resident, and neighbor to Taddle Creek, Kathleen now lives and works near the St. Lawrence River in Montreal, where she is Concordia University’s Research Chair in Socially Engaged Art and Public Pedagogies. In this workshop, participants created herb gardens that integrate the five senses into their concept, design and cultivation. The approach was similar to that of an artist creating a temporal artwork using materials that unify over time, evolving into a fleeting expression of imperfection, impermanence and elemental beauty. Thom Sokoloski is a multi-disciplinary artist whose practice explores the nature of engagement in art and its relationship to perception, memory and the unconscious. Form and spirit play an important role in the materials he chooses to incorporates during his process, as does the potential for contemplation within the space each artwork is presented. Did you know that clay is actually a type of soil? It’s found near water and can be used to make a wide variety of useful objects, from bricks and dishes to vases and sculpture. This workshop, led by the Gardiner Museum’s Karen Cuevas, encouraged festival-goers to sculpt a clay pot in the form of an animal, then take it home, plant a seed in the pot and watch it grow. The Gardiner Museum is Canada’s national ceramics museum, and one of the world’s great specialty museums. The Museum is committed to making a contribution to the medium it celebrates, as well as the community it serves, striving to be an inviting destination that inspires and connects people, art, and ideas through clay. Never painted before? No Problem! At How We Live In Cities Garden Centre, festival-goers explored a garden themed ecology project through painting, guided by a friendly and professional instructor Jibola Fagbamiye and team. Participants were offered step-by-step instruction to create an original garden painting to take home with them. Jibola Fagbamiye is an artist and illustrator. He was born in Nigeria and lives in Toronto, where he runs a social painting studio called Sip and Paint. His work mixes digital design, traditional painting and comic illustration. BEE alive and BEE aware! Toronto is a ‘Bee City,’ made possible by our abundant gardens and green spaces. During this workshop at the How We Live In Cities’ Garden Centre , visitors engaged in hands-on bee friendly projects and initiatives that built interest in environmental stability, while informing and encouraging support for garden habitats. BEE crowned! Visitors designed, created, and wore beautiful floral headpieces, made using fresh, local flowers and plants. Rayna Sydney, is a Master’s landscape architect student at the University of Toronto and a graduate of environmental studies program at the Ontario College of Art and Design University. The world of tiny insect creatures might seem to be just like the world we live in but it is not. In the insect world, a drop of water might be as big as a car, a parking lot is a vast desert, a bird is a giant monster, a cement wall is a huge cliff face where sand and grit provide many footholds, tree sap is a gooey trap and even a gentle wind can carry you far from where you start. Still nature has given insects a really amazing set of tools. If you like aliens, robots or transformers, you only need to look at the living show in your garden and under your feet! Look at these through a microscope and you will see a miracle of design; antennae that pick perfume out of the air; legs made for walking on ceilings; movable, waterproof suits of armour; skeletons on the outside of their bodies; wings that look like huge sheets of clear plastic, but can twist and turn in flight better than anything we see at an airshow. Look closely. Discover the amazing world of insects! David Hlynsky is an artist, author, teacher and photographer with an interest in exploring insects and their integration into urban settings. In the city we live in, there are many animals that thrive – join the pack! Participants assembled, then wore animal masks while roaming free and enjoying the rest of BIG On Bloor. The project also identified which species living close to cities are at risk, and made information available so that local residents, governments and developers can take them into account. The workshop brought additional attention to these species and their displaced habitats, while encouraging festival-goers to consider the implications of confrontation with wildlife in cities. Animals On Our Street is a call to safe-guard urban animal habitat by protecting, expanding and improving garden and green space. Shyla Tibando is an animator of Free Art Fridays, Toronto (FAFT), a project that places artwork on streets for any member of the public to enjoy and take home. Memorial Parkette was an interactive installation that invited festival-goers to draw from memory a plant that they have loved and lost (whether through natural causes or human error) and add it to a community shrine memorializing the lost plant life. The project was a playful response to the human impulse to memorialize selectively, to ritually mourn the loss of human and animal life, while rarely immortalizing plants with posthumous ceremony and representations. The workshop functioned as a means to reflect on human kinship with the natural world, and the need to take responsibility for the stewardship of flora and green spaces. Jacqui Arntfield is a cultural worker and socially-engaged artist who maintains a collaborative, conceptual and context-specific practice. Activating a background in philosophy and community work, Jacqui uses the arts as a tool for civic engagement, and has worked with numerous community arts organizations including Lakeshore Arts, Artscape Youngplace and 918 Bathurst Centre for Culture, Arts, Media & Education. Her interactive and participatory projects have been featured in public art events throughout Toronto including NXNE Music & Arts Festival, Art of the Danforth, BIG on Bloor Festival, 100in1Day Toronto and The Laneway Crawl Series. Emily DiCarlo is a Toronto-based visual artist who works predominantly in sculpture, video, and performance. She has exhibited her work both locally and abroad including, but not limited to: MU artspace (Eindhoven, NL), NXNE Music Festival, Artscape Youngplace, 99 Gallery (Toronto, CA), The Orthodox Academy (Crete, EL), L’Oeil de Poisson (Quebec City, CA), and The Hungarian Museum of Travel and Tourism (Budapest, HU). She has presented her theories and criticisms as part of the 14th Triennial Conference of the International Society for the Study of Time (Monte Verde, CR), International Artist-in-Residency Summer Program organized by the Hungarian Multicultural Centre (Budapest, HU) and the 16th Triennial Conference of the International Society for the Study of Time (ISST) at the University of Edinburgh. Her writing has been published in 1W3KND: On Social Practice and Collaboration, 48 Hours at a Time (Broken City Lab) and artist book Hydra Era (L’Œil de Poisson). Walk, ride and drive civil streets! In an effort to promote the safe sharing of city roads, visitors designed, customized, and decorated a safety backpack to take home. Brightly coloured and glow-in-the-dark backpack designs help improve nighttime visibility and the safety of pedestrians and cyclists. The backpacks also double as a garden-making statement when patterns of plants and flowers are added. The workshop wa accompanied by an exhibition of example backpacks created by Denessa Gookool. This project was a part of a follow-up BIG/BIA/Civic Studies campaign for traffic calming. Denessa Gookool is an emerging artist and curatorial student at the Ontario College of Art and Design University. Festival-goers helped create a mosaic constructed with plastic bottle caps, while learning the alarming facts about plastic, and how bottle caps represent a surprisingly high percentage of waste. Visitors were encouraged to join STOP Plastic’s campaign to stop single-use plastics, and to understand why this is important for humans, the environment, and for future generations. The STOP Plastic workshop sourced local materials used in creating the mosaic, and fostered discussions about single-use plastics. STOP Plastic is a volunteer run organization looking to help Toronto join other world cities that have banned disposable plastic. The STOP Plastic team hosts various events to further its work, and to advocate for the ban on plastic bags. Bring a book, take a free book. Mind Exchange was a recycling book project for the duration of the festival located at the volunteer station. Marjolein Winterink is the BIG Festival Volunteer Manager, an avid craft person and involved with a number of local citizen community and advisory organizations. Tiny Letter Press gave visitors hands-on opportunity to make garden related imagery and tree prints, using their smallest antique printing press. Using pre-set designs made from wood and metal type, visitors were encouraged to print on a variety of papers. Participants learned how to print like pros and took home beautiful mini prints. Graven Feather, established in 2011, is an arts space committed to working with emerging artists. Starting 2017, they made a big change from their Queen West location. They have started a nomadic year and will be leading events and workshops throughout the city. Graven Feather has also launched residencies and classes from their new cozy studio in the Junction Triangle. Appreciation also goes to MP Julie Dzerowicz for the Federal Government’s Summer Student Program enabling HOW WE LIVE IN CITIES with BIG: Bloor Improvement Group to hire Rayna Sydney and Denessa Gookool. Thank you to TD Friends of the Environment and CELOS for Spot Garden Project Support Thank you again to the BIG organization and to the festival team and to all the artists, programmers, volunteer and others who contribute.